Purple cap is an award of IPL which is presented to the leading wicket taking bowler in a particular season. 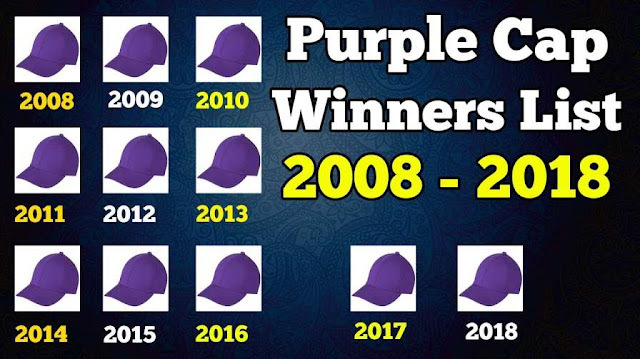 After introducing Orange cap, the IPL introduced Purple cap award also. The bowler who is the highest wicket taker in a particular season, he will wear this cap. That means till the end of the season, the purple cap can roam from one to another. Whoever becomes the leading wicket-taker during the season, he owns the cap. But in the end, only on most wicket taking player will be awarded the purple cap. Until now 11 seasons of IPL has finished successfully and it's gaining popularity every year not only in India but also in other countries. Players from all over the globe come to play in the league. So talking about IPL Purple Cap Holder List, this Purple cap has given to 11 players from different teams till now, every year whoever was the highest wicket taker was presented the Purple cap. Check below IPL Purple cap holder list. So this is the IPL Purple Cap holder List. As you can see in the table of IPL Purple Cap Holder List, Indian bowler got the IPL Purple Cap Holder tag for the most number of times. Now, let's take a brief view on the IPL Purple Cap Holder List of all seasons. Also, Check Who will win IPL 2019? The first season of IPL was played in 2008. BCCI introduced this new format of the game and everybody loved it. The winner of the first season of was Rajasthan Royals and IPL Purple cap holder was Sohail Tanvir who was playing for Rajasthan Royals that year. Playing for Rajasthan, Sohail took 22 wickets in 11 matches and became the first IPL Purple Cap Holder. In the second season of Indian Premier League, IPL Purple Cap holder was an Indian bowler R.P. Singh. While playing for Adam Gilchrist led team Deccan Chargers, R.P.Singh took 23 wickets in 16 matches with the economy 6.98. He was followed by great Indian spin bowler Anil Kumble who took 21 wickets in 16 matches. IPL Purple Cap Holder in the 3rd season was Pragyan Ojha. Again an Indian bowler and playing for Deccan Chargers. Pragyan Ojha took 21 wickets in 21 wickets in 16 matches with the economy of 7.92. In the race of IPL Purple Cap Holder list, Anil Kumble was again on the second spot by taking 17 wickets. Lasith was IPL Purple Cap Holder in IPL 2011. Playing for Mumbai Indian, Lasith Malinga took 28 wickets in 16 matches with a good economy of 5.95. Malinga was the highest wicket-taker till then in an IPL tournament. He was followed by his own teammate Munaf Patel who took 22 wickets. IPL Purple Cap Holder in IPL 2012 was Morne Morkel who was playing for Delhi Daredevils. Delhi Daredevils name is now changed to Delhi Capitals. Morne Morkel took 25 wickets in 16 matches with the economy of 7.19. At the second position in the race for IPL Purple Cap Holder List was Sunil Narine who took 24 wickets. The name comes in the list of IPL Purple Cap Holder is Chennai Super Kings all-rounder Dwayne Bravo. Dwayne Bravo was in the IPL Purple Cap Holder List in IPL 2013. Dwyane Bravo broke all the records and took 32 wickets which is still a record of most number of wickets in an IPL Tournament. He took 32 wickets in 18 matches with the economy of 7.95. At the second spot in the race for IPL Purple Cap Holder List is James Faulkner with 28 wickets. In 2014 again it was a CSK player on top of the IPL Purple Cap Holder List. Mohit Sharma was the IPL Purple cap holder in 2014. He took 23 wickets in 16 matches with the economy of 8.39 and became IPL Purple Cap Holder. He was followed by KKR player Sunil Narine with 21 wickets. In 2015 it's again CSK player and again Dwayne Bravo who was going be the IPL Purple Cap Holder for the second time. This time Bravo took 26 wickets in 17 matches with an economy of 8.14. The second bowler in IPL Purple Cap Holder List was Lasith Malinga with 24 wickets. Once again an Indian bowler became IPL Purple Cap Holder. In IPL 2016 it was our best bowler Bhuvneshwar Kumar who held the purple cap. and the second bowler in the IPL Purple Cap Holder List was Yazuvendra Chahal with 21 wickets. Once again IPL Purple Cap Holder was Bhuvneshwar Kumar back to back. In 2016 and 2017 both years, Bhuvneshwar Kumar was the IPL Purple Cap Holder. Bhuvneshwar took 26 wickets in 14 matches with the economy of 7.05. Jaidev Unadcut was on the second number in most wicket takers list in IPL 2017wich 24 wickets. The most recent IPL tournament was IPL 2018. The IPL Purple Cap Holder in IPL 2018 was Andrew Tye playing for Kings XI Punjab. Though KXIP were struggling with the poor performance, Andrew tye was the player who did really well. Andrew Tye took 24 wickets in 14 matches with the economy rate of 8. The second player in the list is Rashid Khan with 21 wickets. So that is the complete IPL Purple Cap holder List. As the IPL 2019 Auction is finished and teams are ready to fight. Whom do you think as the strongest team? Who will be IPL 2019 Purple cap holder?